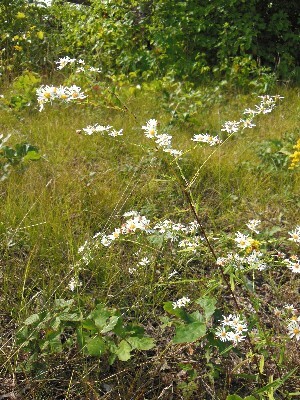 Aster dumosus of Michigan Flora. Sandy to mucky or marly shores of lakes and ponds (or even wet borrow pits), interdunal hollows; sedge meadows, wet prairies, fens; conifer thickets, sandy banks and clearings, sometimes associated with oaks and jack pines. The numerous, rather uniform, blunt or acute and callus-tipped bractlets on elongate pedicels (or branchlets) are quite characteristic of this species, but do sometimes occur in S. ontarionis. A few plants with deeply lobed disk corollas, many little bractlets on the pedicels, and leaves glabrous beneath may be hybrids of S. dumosum and S. lateriflorum (or S. ontarionis). Our specimens of S. dumosum are often quite harshly scabrous on one or both surfaces of the leaves, which in some specimens are smooth. The stems are sometimes short-pubescent. The rays are usually white with us, rarely pink or purple. Unusual plants with small heads and short pedicels from Berrien and Van Buren Cos. may be S. racemosum (Elliott) G. L. Nesom, or possibly of hybrid origin; S. racemosum is not acknowledged from Michigan by Brouillet et al. (2006). MICHIGAN FLORA ONLINE. A. A. Reznicek, E. G. Voss, & B. S. Walters. February 2011. University of Michigan. Web. April 21, 2019. https://michiganflora.net/species.aspx?id=481.